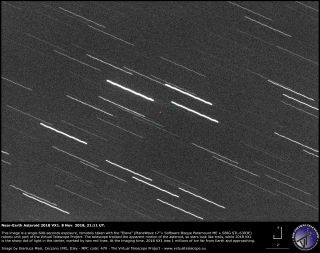 The Virtual Telescope Project captured this image of the near-Earth asteroid 2018 VX1 on Nov. 8, 2018. A newfound asteroid will zip past Earth today (Nov. 10), and you can follow the interloper's trek live online. The asteroid 2018 VX1, which scientists think is from 26 feet to 59 feet wide (8 to 18 meters), will get within about 236,000 miles (380,000 kilometers) of our planet during this pass. That's a smidge closer than the moon, which orbits Earth at an average distance of about 239,000 miles (384,600 km). The Virtual Telescope Project will air a show about 2018 VX1's flyby on Saturday, starting at 1 p.m. EST (1800 GMT). You can watch the show live here at Space.com, or directly via the Virtual Telescope Project. 2018 VX1 was discovered just last week, on Nov. 4. The asteroid takes about 1.6 Earth years to complete one lap around the sun. There is no risk of an impact on this flyby of our planet, scientists say. Two other newly discovered asteroids will also zoom through Earth's neighborhood Saturday, though neither one will get nearly as close as 2018 VX1 will. 2018 VS1 and 2018 VR1, both of which were also first spotted last week, will cruise by at distances of about 800,000 miles (1.3 million km) and 3.1 million miles (5 million km), respectively. Such surprise visits reinforce just how many near-Earth asteroids (NEAs) are out there and how few of them astronomers have spotted. The NEA population is thought to number in the millions, but researchers have detected and tracked just 19,000 such objects to date. There is some good news, however: The risk of a cataclysmic, potentially civilization-ending impact is low, at least for now. Scientists think they've found more than 90 percent of the mountain-size NEAs out there, and none of them pose a threat for the foreseeable future.